Mwadalu R, Mwangi M. 2013. 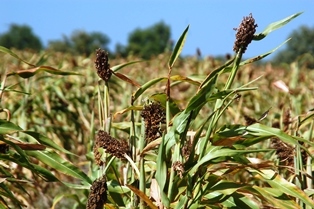 The potential role of sorghum in enhancing food security in semi-arid eastern Kenya: A review. Journal of Applied Biosciences 71:5786-5799. Abstract. Successive droughts in Kenya compounded with other socio-economic constraints have led to persistently unstable and declining agricultural productivity in semi-arid eastern Kenya. This has given rise to the need to find coping strategies that would include growing alternative crops that are drought tolerant and thus suitable for the areas. Research in Kenya and elsewhere has shown that sorghum (Sorghum bicolor L. Moench) has the potential to end severe food insecurity in ASALs due to its tolerance to drought and ability to thrive under a wide range of soils. However, research and government policy in Kenya have shown a continual inclination to maize production in these areas though the crop is regarded a high risk option due to poor adaptation especially to the low rainfall. This paper reviews the potential of sorghum for improving food security in ASALs of Kenya with specific focus on semi-arid eastern Kenya. This will contribute to the ongoing debate to inform private and public sector policy and investments for increasing production of sorghum and other drought tolerant crops in the ASALs as a way of alleviating food insecurity and poverty. This article often refers to the pest bird, Red-billed Quelea. The full paper may be downloaded here.